The New General Catalogue of Nebulae and Clusters of Stars (abbreviated as NGC) is a catalogue of deep-sky objects compiled by John Louis Emil Dreyer in 1888. 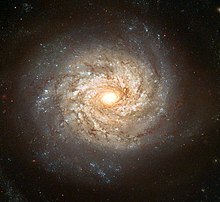 It expands upon the cataloguing work of William and Caroline Herschel, and John Herschel's General Catalogue of Nebulae and Clusters of Stars. The NGC contains 7,840 objects, known as the NGC objects. It is one of the largest comprehensive catalogues, as it includes all types of deep space objects, including galaxies, star clusters, emission nebulae and absorption nebulae. Dreyer also published two supplements to the NGC in 1895 and 1908, known as the Index Catalogues, describing a further 5,386 astronomical objects. Objects in the sky of the southern hemisphere are catalogued somewhat less thoroughly, but many were observed by John Herschel or James Dunlop. The NGC had many errors, but an attempt to eliminate them was initiated by the NGC/IC Project in 1993, after partial attempts with the Revised New General Catalogue (RNGC) by Jack W. Sulentic and William G. Tifft in 1973, and NGC2000.0 by Roger W. Sinnott in 1988. The Revised New General Catalogue and Index Catalogue (abbreviated as RNGC/IC) was compiled in 2009 by Wolfgang Steinicke. Assembling the NGC was a challenge, as Dreyer had to deal with many contradicting and unclear reports, made with a variety of telescopes with apertures ranging from 2 to 72 inches. While he did check some himself, the sheer number of objects meant Dreyer had to accept them as published by others for the purpose of his compilation. The catalogue contained several errors, mostly relating to position and descriptions, but Dreyer referenced the catalogue, which allowed later astronomers to review the original references and publish corrections to the original NGC. The first major update to the NGC is the Index Catalogue of Nebulae and Clusters of Stars (abbreviated as IC), published in two parts by Dreyer in 1895 (IC I, containing 1,520 objects) and 1908 (IC II, containing 3,866 objects). It serves as a supplement to the NGC, and contains an additional 5,386 objects, collectively known as the IC objects. It summarizes the discoveries of galaxies, clusters and nebulae between 1888 and 1907, most of them made possible by photography. A list of corrections to the IC was published in 1912. Nearly 800 objects are listed as "non-existent" in the RNGC. The designation is applied to objects which are duplicate catalogue entries, those which were not detected in subsequent observations, and a number of objects catalogued as star clusters which in subsequent studies were regarded as coincidental groupings. A 1993 monograph considered the 229 star clusters called non-existent in the RNGC. They had been "misidentified or have not been located since their discovery in the 18th and 19th centuries". It found that one of the 229—NGC 1498—was not actually in the sky. Five others were duplicates of other entries, 99 existed "in some form", and the other 124 required additional research to resolve. As another example, reflection nebula NGC 2163 in Orion was classified "non-existent" due to a transcription error by Dreyer. Dreyer corrected his own mistake in the Index Catalogues, but the RNGC preserved the original error, and additionally reversed the sign of the declination, resulting in NGC 2163 being classified as non-existent. NGC 2000.0 (also known as the Complete New General Catalog and Index Catalog of Nebulae and Star Clusters) is a 1988 compilation of the NGC and IC made by Roger W. Sinnott, using the J2000.0 coordinates. It incorporates several corrections and errata made by astronomers over the years. The Revised New General Catalogue and Index Catalogue (abbreviated as RNGC/IC) is a compilation made by Wolfgang Steinicke in 2009. It is a comprehensive and authoritative treatment of the NGC and IC catalogues. ^ Dreyer, J. L. E. (1878). "A Supplement to Sir John Herschel's "General Catalogue of Nebulae and Clusters of Stars"". Transactions of the Royal Irish Academy. 26: 391–426. Bibcode:1878RIATr..26..381D. JSTOR 30079091. ^ Bradt, H. (2004). Astronomy Methods: A Physical Approach to Astronomical Observations. Cambridge University Press. p. 52. ISBN 978-0-521-53551-9. ^ a b c Corwin, H.G. Jr. (12 October 1999). "The NGC/IC Project: An Historical Perspective". The NGC/IC Project. Retrieved 2012-04-22. ^ Dreyer, J. L. E. (1912). "Corrections to the New General Catalogue resulting from the revision of Sir William Herschel's Three Catalogues of Nebulae". Monthly Notices of the Royal Astronomical Society. 73: 37–40. Bibcode:1912MNRAS..73...37D. doi:10.1093/mnras/73.1.37. ^ Sulentic, J. W.; Tifft, W. G. (1973). The Revised New Catalogue of Nonstellar Astronomical Objects. University of Arizona Press. Bibcode:1973rncn.book.....S. ISBN 978-0-8165-0421-3. ^ "Monograph No. 1 - The "Non-Existent" Star Clusters of the RNGC". Webb Deep-Sky Society. Retrieved 29 May 2017. ^ Allison, Mark (4 April 2006). Star Clusters and How to Observe Them. Springer Science & Business Media. pp. 62–63. ISBN 9781846281983. Retrieved 29 May 2017. ^ O'Meara, Stephen James (12 April 2007). Deep Sky Companions: Hidden Treasures. Cambridge University Press. pp. 175–176. ISBN 9781139463737. Retrieved 30 May 2017. ^ "NGC2000 - NGC2000.0: Complete New General Catalog and Index Catalog". Goddard Space Flight Center. Retrieved 2012-04-22. ^ Sinnott, R. W. (1988). NGC 2000.0: The Complete New General Catalogue and Index Catalogues of Nebulae and Star Clusters. Sky Publishing. ISBN 978-0-933346-51-2. ^ Erdmann, R. E. (2010). "The NGC/IC Project". The NGC/IC Project. Retrieved 2012-04-22. ^ Steinicke, W. (17 January 2012). "Revised New General Catalogue and Index Catalogue". Retrieved 2012-04-22. ^ Steinicke, W. (2010). Observing and Cataloguing Nebulae and Star Clusters: From Herschel to Dreyer's New General Catalogue. Cambridge University Press. ISBN 978-0-521-19267-5. ^ Duerbeck, H. W. (2009). "Book Review: Nebel und Sternhaufen - Geschichte ihrer Entdeckung Beobachtung und Katalogisierung (Steinicke)". Journal of Astronomical History and Heritage. 12 (3): 255. Bibcode:2009JAHH...12..255D. ^ Duerbeck, H. W. (2011). "Observing and Cataloguing Nebulae and Star Clusters. From Herschel to Dreyer's New General Catalogue (Steinicke)". Journal of Astronomical History and Heritage. 14 (1): 78. Bibcode:2011JAHH...14Q..78D. Wikimedia Commons has media related to NGC objects. Wikimedia Commons has media related to IC objects.